The situation is urgent: Seventy years after whaling was banned, the North Atlantic right whale population has not recovered. Only 300 to 350 remain, and the species is headed toward extinction. 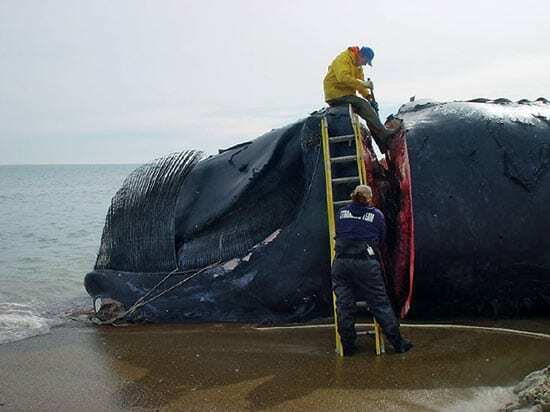 The threats remain dire: Right whales are frequently struck and killed by ships or become fatally entangled in fishing gear, because their migratory routes overlap with major fishing areas and heavily trafficked shipping lanes along the east coasts of the United States and Canada. In addition, the whales aren’t reproducing consistently or fast enough to increase their numbers—perhaps because of disease, pollutants, poor food supplies, or genetic problems. In November 2003, the WHOI Ocean Life Institute convened a forum in Woods Hole, gathering scientists from several institutions, along with representatives from government and industry, to devise a collaborative research plan to accelerate our understanding of right whale habits and habitats. 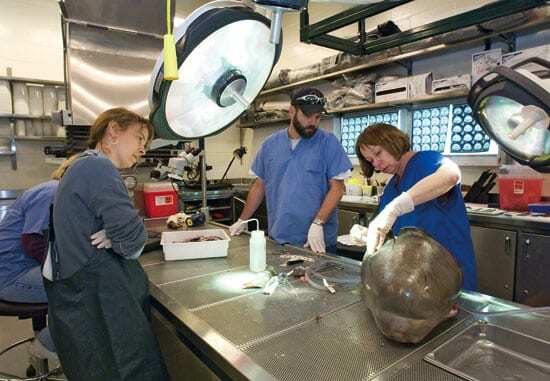 The Institute began a Right Whale Research and Conservation Initiative, with the aim of supplying knowledge, tools, and strategies for more effective conservation efforts. Catalyzed by funding from the Penzance Foundation, the North Pond Foundation, and the Virginia Wellington Cabot Foundation, the Ocean Life Institute launched several research projects that blend the expertise of scientists at WHOI and other institutions. Here are reports on some of their initial efforts. Why don’t right whales hear large ships coming and avoid collisions? Can underwater alarm systems be designed to warn whales of approaching vessels? Researchers have been thwarted in their attempts to answer these questions by a lack of fundamental knowledge of how—and how much—whales can hear. With funding from the Right Whale Initiative, WHOI biologists Darlene Ketten and Susan Parks generated CT scan images of the internal anatomy of mammal ears to provide the first estimates of the frequency range of right whale hearing. Measuring hearing in large, rare, elusive marine mammals would have been impossible without the WHOI CT scan facility for oceanographic research. It has enabled Ketten and colleagues to react quickly to scan and image the ears of whales that stranded and died, as well as ears of other large mammals for comparison. The researchers measured cochleas—the spiral structures found in all mammal inner ears. By comparing whale cochleas with those of land mammals (whose hearing ranges are known), Ketten showed that whales have some of the widest hearing ranges of any mammal. To test whether their right whale hearing estimates hold up in real life, Parks teamed with WHOI biologist Peter Tyack and colleagues, who place noninvasive suction-cup “tags” on whales to record ambient sound and whale behavior. The combined work has allowed scientists to determine what sounds whales respond to and to consider possible ship alarm strategies to help avoid collisions. What’s the breaking point of bones hit by ships? Collisions with ships often leave right whales with broken jaws, but scientists have lacked even the most rudimentary knowledge of whalebone structure and properties to determine how bones stand up to impacts from ship hulls. Regina Campbell-Malone, a WHOI/MIT Joint Program graduate student, WHOI biologist Michael Moore, and colleagues from the University of New Hampshire conducted biomechanical studies of whale jawbones to obtain the first detailed data on the bones’ flexibility, strength, and breaking points. Such studies will help establish the threshold speeds and masses of vessels that will or will not kill whales in collisions. They will help determine if reducing vessel speeds in critical right whale habitats would reduce the likelihood of fatal fractures. To test the jaw’s biomechanical response to applied stress, the researchers suspended jawbones from a crane and loaded 1,000 pounds of weights onto a pallet hanging from the bone. Small sensors called strain gauges measured the bones’ strength limitations and breaking points. The researchers have also used CT scans of jawbones to investigate the bones’ density and structure (including their interior structure) and to gain insights into the bones’ capacities. Is there a link between food supplies and pregnancies? Like North Atlantic right whales, South Atlantic right whales (a separate but related species) were also hunted to precariously low levels. But the southern right whale population has rebounded dramatically since whaling was banned. 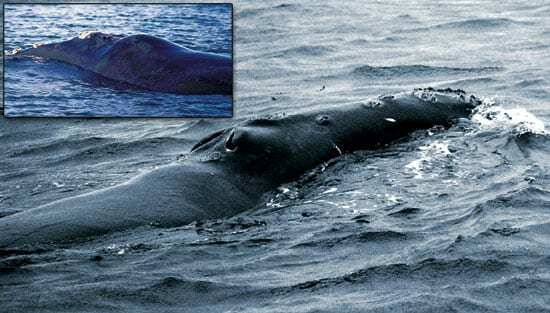 The photos at right offer a clue: The southern whales often have a major roll of fat behind their blowhole, which their northern cousins lack. Carolyn Miller Angell, a WHOI guest student, and her advisor, WHOI biologist Michael Moore, developed a cantilevered pole system to measure blubber thickness in right whales swimming in the ocean. Their research indicates that whales likely require adequate nutrition and body condition to achieve successful pregnancies. Angell, who defended her doctoral thesis on the results of the research in August 2005, also showed a link between the amount of food available to whales in different years and their ability to produce calves. The research has spurred a new study by WHOI guest student Nadine Lysiak to analyze isotopes in whale baleen, the fibrous food-filtering material in their mouths. As they grow, whales incorporate into their baleen isotopes from their prey and from the waters they swim in. The experimental technique offers the potential to provide annual histories, much like tree rings, of where and when the whales traveled and what they ate. The work may also pinpoint previously unrecognized migration patterns or feeding habitats—or changes in these caused by shifts in ocean circulation or climate. A gift from WHOI Trustee Hardwick Simmons and his wife, Sloan, is funding the research. What factors are preventing population growth? Assessing the state of the North Atlantic right whale population—and ways to preserve it—requires the messy but essential task of determining how and why whales are dying. WHOI biologist Michael Moore, co-investigator William McClellan of the University of North Carolina, Wilmington, and colleagues from many other institutions have undertaken six necropsies in the past 18 months, determining that the whales were mainly killed by ship collisions and fishing gear entanglements. The animals were predominantly pregnant females, which represent serious lost potential for future births. Statistical models of whale population dynamics by biologist Hal Caswell and other WHOI researchers have indicated that the deaths of mature female right whales constitute a critical factor for survival of the species. The study showed that if just two to three adult female deaths could be prevented each year, the population trend would switch from declining to growing. Caswell has continued his studies to identify other sensitive factors that could be targeted to help devise effective management strategies that will bolster population growth. Like this whale, the population of North Atlantic right whales is headed downward. The species has never recovered after whaling ended in 1935, and only an estimated 300 to 350 remain. Photos by David Wiley, Stellwagen Bank National Marine Sanctuary. Graduate student Regina Campbell-Malone studies the structure and properties of whale jawbones to determine how they stand up to impacts from ship collisions. Photo by Tom Kleindinst, WHOI. A southern right whale (inset) shows a roll of fat behind its blowhole, which northern right whales often lack. WHOI research indicates that southern right whales (unlike northern right whales) may have increased their population because they are getting adequate nutrition to achieve successful pregnancies. Photos by Carolyn Angell, WHOI. WHOI biologist Michael Moore (top) begins a necropsy to determine what killed this right whale. Photo by Regina Campbell-Malone, WHOI. With time running out, an ambitious research plan is launched for an endangered species. Whither the North Atlantic Right Whale? Scientists explore many facets of whales' lives to help species on the edge of extinction. Biomedical imaging reveals new insights into marine mammal ears.